Man, do I loooove me some pancakes in the morning. 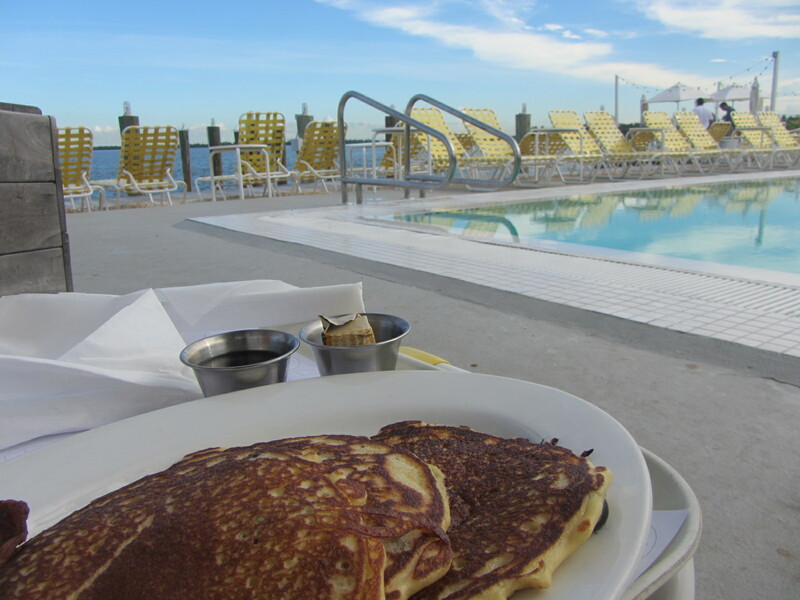 Wait, better than that: I loooove me some blueberry pancakes eaten poolside in the morning, while the sun is still climbing the sky and the breeze from the bay is rolling in and I’m on vacation. Man, do I love those pancakes. Those were precisely the ones I had last Friday when I woke up at The Standard Hotel in Miami, threw on a bathing suit and sauntered over to the pool to enjoy a deliciously lazy morning. Sure, my fluffy buttermilk pancakes oozing with juicy, fat blueberries were delicious (especially after my thick, generous pour of maple syrup) but really it was the view across the water, the quiet of the early morning, and the wonderful and rare feeling of not having a single other thing to worry about at the moment that made them so wonderful. Oh to be back in that moment with those pancakes and that view. It’s been almost eight years since I last lived in Miami and almost four since I lived in Florida in general. And for the most part, I haven’t ever wanted it any different. No homesickness for this girl. But every once in a while when I’m back there, something, whether it’s a 70 degree day in early January or a plate piled high with Cuban food, makes me kind of miss the ol’ Sunshine State. 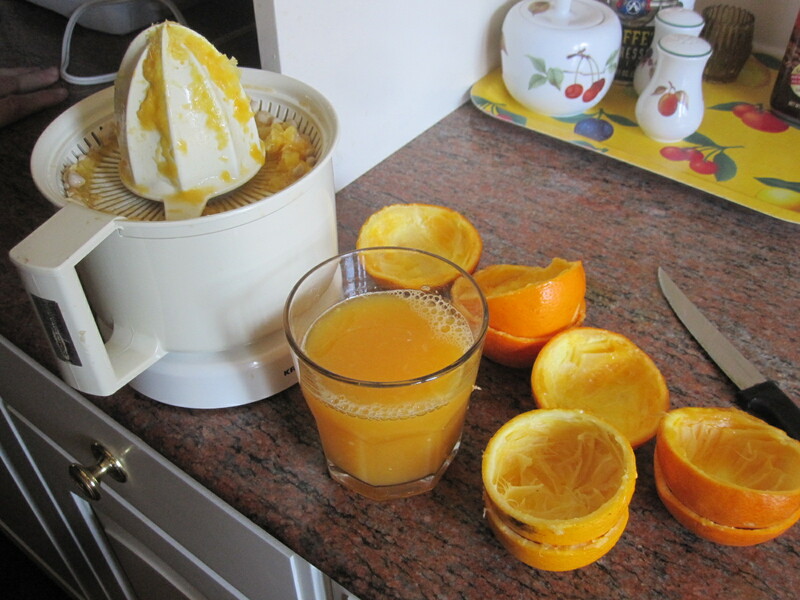 A couple of weekends ago, while the boyfriend and I spent the weekend in Lakeland, Florida with his family, that something was a glass of fresh squeezed orange juice made from fat, ripe oranges plucked from trees out in the backyard. Even slightly warm from spending the early morning hours in the sun, the juice from those oranges was sweet and tart with just the right amount of pulp (i.e. not chunky but not so slick and smooth either that it brings back nightmares of Sunny Delight). Is there anything more simple, more quintessential, more reminiscent of everything good about home than fresh squeezed OJ on a warm February morning? Nope. Not on most days. Good thing they bottle it. Right before catching a plane back to New York we decided to eat one last meal in Florida, and what better place to wrap up a a relaxing beach weekend than at Tommy Bahama. Didn’t know Tommy Bahama sold food? Yea well, me either. I thought they only sold linen shirts, swim trunks and other I’m-on-vacation clothing but apparently the “Purveyor of Island Lifestyles” also has a chain of restaurants. We made a pit stop in Sarasota and checked it out. I have to say, I was somewhat skeptical. In my head I was ready to write the whole place off. Beachwear and food shouldn’t necessarily come from the same place, right? I mean, I don’t pick up bikinis at the supermarket. 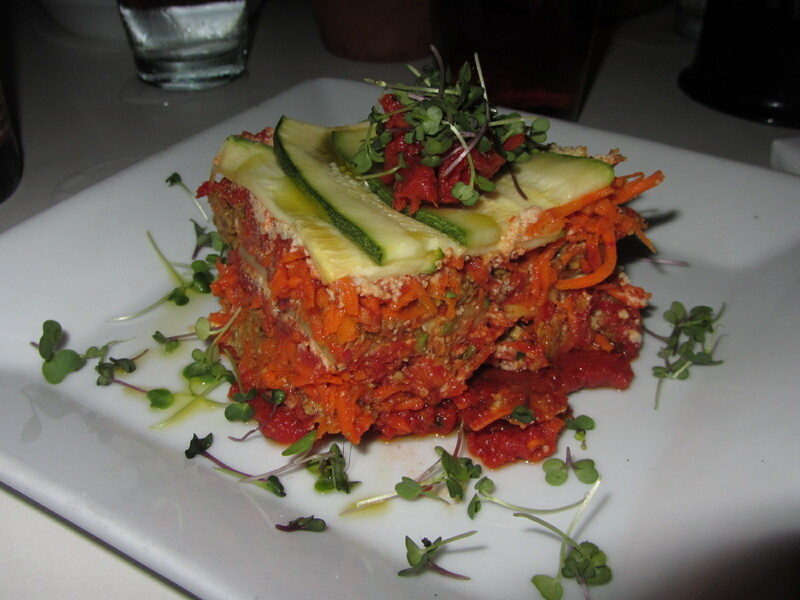 Just because Tommy could make nice casual island getups didn’t mean he come make nice food, I reasoned. But I’m happy to report, I was wrong. Going with the recommendation of someone who’d already been there, I went with the fish tacos. One, because it seemed fitting to eat seafood in a beach town and two, because I’d never actually had fish tacos before. (I’m usually a beef or chicken kind of girl.) 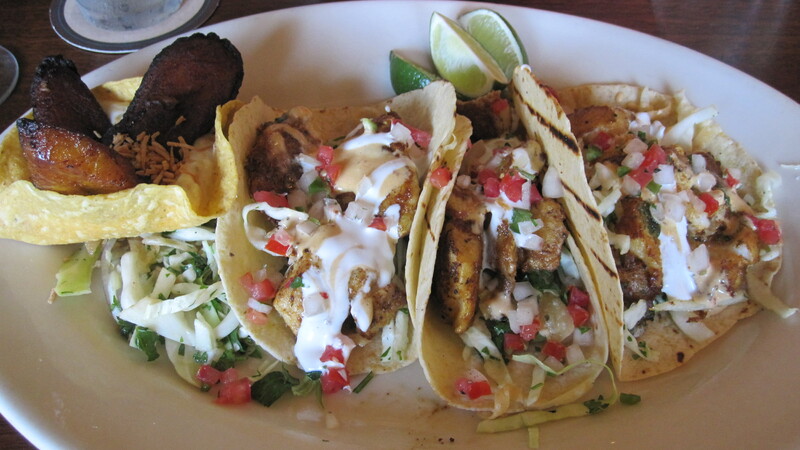 The three soft, white corn tortillas full of blackened fish (no, I actually don’t know exactly what fish), pico de gallo and a spicy chipotle aioli sauce were colorful in appearance and taste. The fish was tender and soft with that slightly burnt spiciness I love from the blackened outside. The other ingredients gave it a zesty, peppery savoriness that was refreshingly unlike most tacos I’ve eaten. With the tacos came a kind of weird side: three fried plantains in a crispy tortilla shell filled with a pineapple and coconut sauce. I love plantains so I of course ate this up quickly, but I didn’t get why they were cold, almost like they’d been pulled out of the fridge. Maybe it was to play off the warmer flavors of the tacos, but this could of been much better if they were heated up. 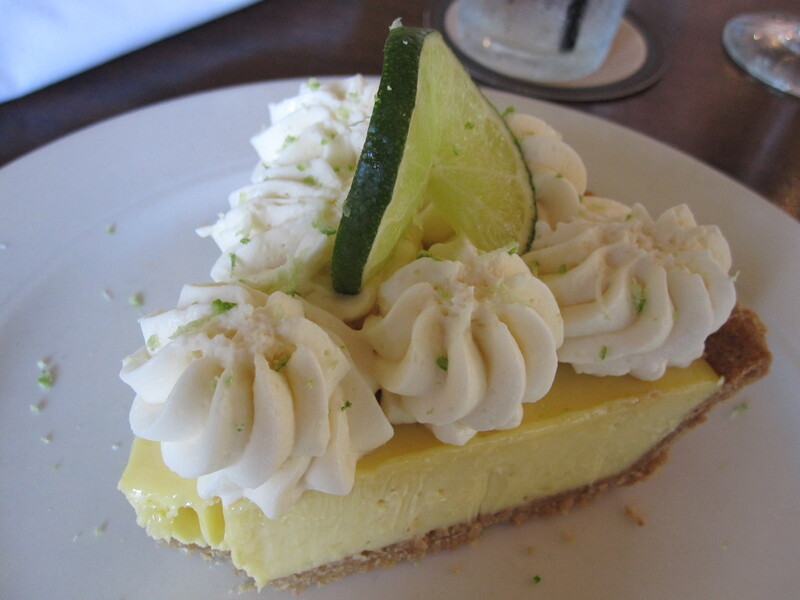 My last wish while in my ol’ home state was that I get a slice of my favorite Florida dessert: Key lime pie. Tommy’s was good, and as the waiter had put it, was “not too sweet, not too tart.” It had a nice thick, creamy consistency and a subtle citrus after taste. My only suggestion for improvement would’ve been to top it with a little less whip cream. All that fluffy white cream took the spotlight off the tangy key lime flavor. Aside from that, it was a sweet adieu to Florida. I had another island to get back to and Tommy Bahama wasn’t exactly the purveyor of that one’s lifestyle. 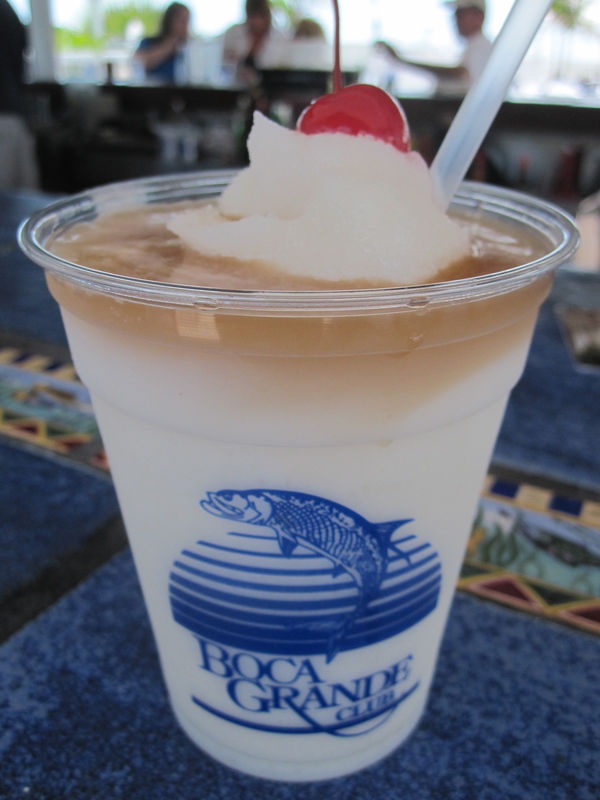 It's not a beach vacation without one. I’m not the Sunshine State’s biggest fan, but seriously, nothing tops the feeling of lounging on a quiet stretch of beach with a piña colada in hand, toes in the sand, breeze through your hair and nothing but turquoise water clear to the horizon, all a thousand miles away from work and the hubbub of New York. Eighty percent humidity never felt so good.